Email: geo-matching@geomares.nl Geo-matching.com is the independent product comparison website for professional hard- and software for geomatics and adjacent fields. The website leads you through the maze of specifications and gives the opportunity to compare products of different producers, read up on reviews given by users, in order to reach a balanced judgment before buying. Corporate Membership Category: E Geotrilho Topografia Engenharia e Projecto lda from Portugal joined FIG in July as a basic level corporate member. Corporate Membership Category: C Magellan Navigation joint FIG as a corporate member in October 2008 at the silver level. Recognized as an industry innovator, Magellan is the creator of the ProMarkTM 3, the best-selling single frequency GPS survey product line on the market, the ProMarkTM 500 multi-frequency, multi-constellation GNSS survey system, the award-winning Magellan RoadMate® series portable car navigation systems, MaestroTM, CrossoverGPSTM, the Magellan Triton outdoor handheld navigation devices, and the Hertz® NeverLost® car navigation system. Magellan is privately held and headquarters in Santa Clara, Calif. For more information about Magellan, visit: www.magellangps.com. Corporate Membership Category: F REIDIN.com joined FIG in October 2008 as a corporate member in membership category F.
REIDIN.com is the world's first online information company providing a range of intelligence products dedicated to meeting the unique requirements of Real Estate Market professionals interested in Emerging Markets. REIDIN.com collects data and information from various different sources: Newspapers, Newswires, Magazines, Research Houses, Financial Institutions, Real Estate Agents, Legal Firms, Municipalities, Government Institutions, Consultants, etc. Then REIDIN.com content and data management team and backend systems processes and structures this information into intelligence and disseminates via its website and email newsletters. REIDIN.com covers all politically stable developing countries which attract a big amount of FDI into its Real Estate markets: China, India, Russia, Brazil, Turkey, Bulgaria, GCC (Saudi Arabia, UAE, Qatar, Kuwait, Bahrain, Oman) and much more. Corporate Membership Category: F ORBITS Engineering Firm from Saudi Arabia joined FIG as a corporate member in September 2008 in level F.
GEO:connexion Ltd, publisher of GEO:connexion Magazine and GEO:connexonUK Magazine joined FIG as a corporate member in December 2003. GEO:connexion is a business-to-business magazine for geotechnology industry professionals within Europe, the Middle East and Africa. Published 10 times per year, its monthly circulation is 14,000 copies. Geo:connexion is FIG corporate member in membership category E.
Dr.-Ing. Holger Schade from SICAD GEOMATICS gets his membership certificate from Prof. Holger Magel, FIG President in Paris. SICAD Geomatics GmbH & Co. (www.sicad.de) from Germany joined FIG as a Corporate Member in membership category B during the FIG Working Week in Paris in April 2003. Focal points for the FIG co-operation are Dr.-Ing. Holger Schade, who also made a keynote presentation in Paris and Robert Klarner, Manager of Communication. Since 1979 SICAD has been an important pacemaker for geographical information systems. It is significantly involved in the development and optimization of spatial data processing - aiming at producing a computer that can actually "see". More than 1000 customers around the globe are already reaping the benefits of the expertise and unique experience of SICAD GEOMATICS. The SICAD product family offers open, up-to-date GIS core technology for use in technical applications for all important sectors. In addition, SICAD offers outstanding standard applications with a wide distribution that both ensures users an exceptionally high degree of security and also guarantees constant refinement and further development. SICAD enjoys particular acceptance by GIS users in the area of geodata management. We are especially committed to a professional approach and to the use of geodata via the internet. SICAD is characterized by its worldwide distribution. This is underscored by its more than 4,000 installed systems in 17 language versions and a total value in excess of over 500 million euro. No matter whether our customers are in Germany, Europe, Russia or Asia, we and our partners are on hand to provide on-site consulting and support. GEOEXPERT is an association of French surveying companies, the aim of which is to work together in the international market. It considers that the French experience in land policies is very rich, but poorly represented in the world. The French chartered surveyor has both high technical engineering standards, and the experience of a successful private-public partnership. The association works as a coordinating body and has no commercial activity, as such. Rafic Khouri, Secretary General of GEOEXPERT receives his membership certificate at the FIG General Assembly in Paris in April 2003. Intergraph Mapping and Geospacial Solutions has joined FIG as a Corporate Member in March 2003. Ms. Rachel Rodgers, Director Marketing communication, has been appointed to focal point for FIG contacts. Intergraph Mapping and Geospatial Solutions is a leading geospatial solutions provider for markets including local, state and federal government; transportation; utilities; communications; locations-based services; photogrammetry; remote sensing; cartography; and military and intelligence. These solutions can be deployed on the desktop, Web, or with mobile technology. Central to these innovations is Intergraph Mapping and Geospatial Solutions’ industry-proven mapping and geospatial technology, including the GeoMedia®, Digital Cartographic Studio® (DCS), Modular GIS Environment (MGE), G/Technology, FRAMME TM, InService and TerraShare TM platforms. As a founding and strategic member of the Open GIS Consortium (OGC), Intergraph continues to be committed to open systems solutions and data interoperability. January 30-31, 2003, the second Leica Top Event, a sort of a customer club took place at Bregenz/Austria. The two days meeting with some 50 participants from all segments of professional surveying was grouped into two sections. One were company and product presentations and second was a visit to the Leica factory at nearby Heerbrugg / Switzerland. The highlight of the Top Event was the very lively speech of the FIG President Univ. Prof. Dr.-Ing. Holger Magel, Munich. Programme of the LEICA TOP EVENT 2003. President Holger Magel made a keynote presentation at the Leica TOP EVENT 2003 January 30, 2003. Environmental Systems Research Institute, Inc. (ESRI) has upgraded its membership in FIG to the platinum level starting in 2003. The FIG contact person in ESRI is Mike Weir, Surveying Industry Manager. 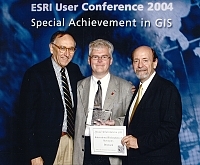 Jack Dangermond, President and Founder of ESRI is further Honorary Chair of the FIG Foundation. UN-HABITAT, the UN agency responsible for helping governments to address the problems of human settlements and rapid urbanization, received a grant of US$ 15,000,000 from the Environmental Systems Research Institute (ESRI) the leading developer of Geographic Information Systems software (GIS). This ambitious international grants initiative has been given by ESRI to UN-HABITAT's Global Urban Observatory, an international capacity building network established to help meet the goals of the Habitat Agenda, which was endorsed at Habitat II in 1996. More recently, the General Assembly mandated UN-HABITAT to monitor the implementation of the Millennium Development Goal, target 11, which is committed to improving the lives of 100 million slum dwellers by 2020. "Most local authorities in the developing world have outdated information about the state of their cities. Few of them have the technologies to collect and analyze data about basic infrastructure and the current status of housing," said Mrs. Anna Tibaijuka, the Executive Director of UN-HABITAT at the launch of the initiative. "If we are going to improve the living conditions of the urban poor, city authorities must be provided with the necessary tools, technology and training. We are grateful to the software developer ESRI for this generous grant. It will enable cities in Africa and Asia to produce accurate and accessible information. This is the basic right of every citizen and is also essential for good urban governance." The goal of the grant program is to provide GIS technology and training for up to 1,000 cities in developing countries so that they can participate in the collection of urban indicator information. Urban indicators include information about poverty, environmental degradation, lack of urban services, degeneration of existing infrastructure, and the lack of access to land and adequate shelter. Cities can use GIS for the collection and analysis of urban indicator data to facilitate better urban management and the formulation of participatory development policies. The GUO grant program will be implemented in a phased approach. Initially, in 2003, grants will be awarded to provide GIS technology and training to 350 cities that currently do not have access to the technology. The grants to the cities will consist of a package of GIS software, technical support and upgrades, and training. They are valued at approximately $15,000 each, making the entire program worth about $15 million dollars. 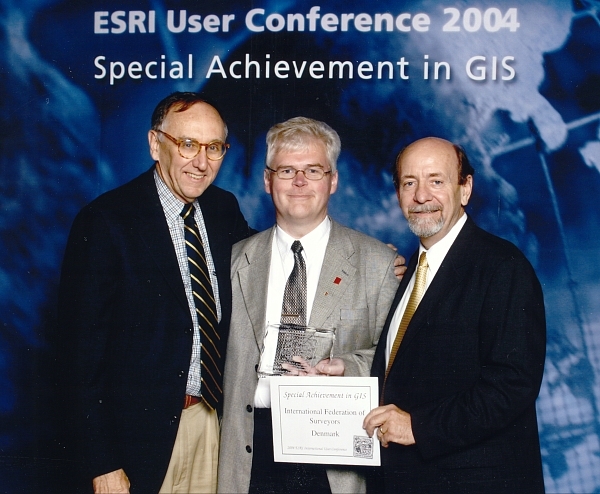 "I believe that GIS technology can truly make a positive contribution in improving the general quality of life for the impoverished people of the world," comments ESRI President Jack Dangermond. "We at ESRI are honored to offer this support to the UN-HABITAT Global Urban Observatory program."